? - a poor move. Basically a mistake that should not of been played. !! - an outstanding move. Such moves are usually very hard to find and clearly superior to other moves. ?? - a very bad mistake. A blunder which normally loses material, overlooks a checkmate or some other bad outcome. !? - an interesting move but perhaps not the best move available, this can also be an enterprising move which deserves attention. Sometimes !? is a temporary state for a move as with more practice its symbol can change. ?! - a dubious move, probably objectively poor but could be hard to refute so has more merit than ? moves. - only move, all other moves are grossly inferior. 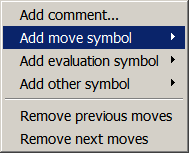 Please note setting a move symbol replaces any existing symbol present. You can also enter the symbols using the keyboard, for example ! enters !, !? enters !? etc. 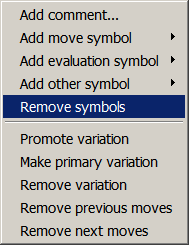 You can remove the symbols by choosing the Remove symbols menu item on the Move context menu.